Welcome to the February 2017 Essentials by Ellen Release Hop! I’ll be showcasing several of the new products on my post today! I also have my own special (and totally unrelated to the new release) kind of theme, based on the weather at my house – I would rather be CRUISING! #ineedavacation! If you’ve come from Lisa’s blog, awesome…if not, start out at the top of the hop HERE! Before I get rolling – here’s the release list…. Need it all? The Complete Release! When I saw the “Spa Day” set – I just wanted to color an icy cold refreshing drink. Seriously. I was filming while my Seattle region was buried under snow (I know, I know, a few inches and we’re toast!). 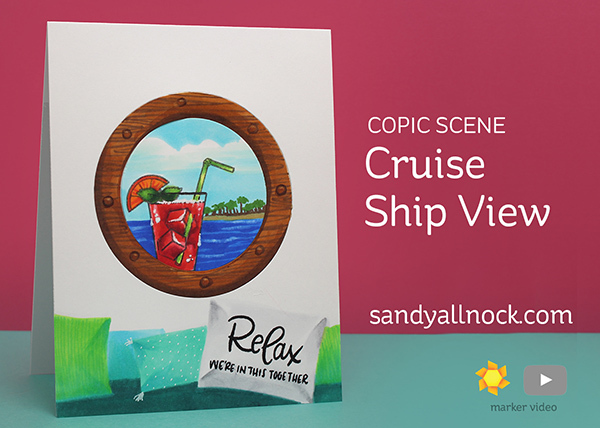 And the thought of looking out the porthole of a stateroom on a cruise ship? Oh man. Channel me some warm sunshine!! Watch the video below or click HERE to see it in HD on YouTube. 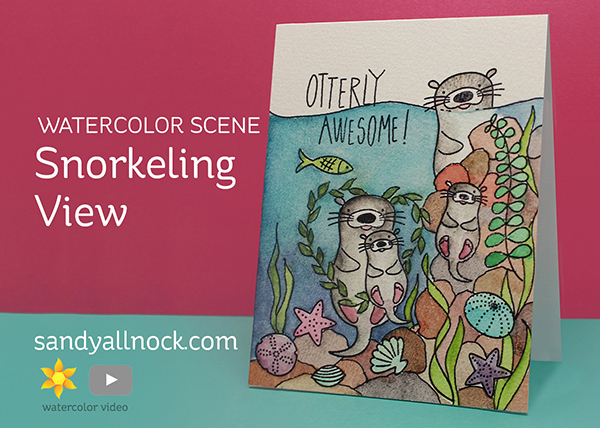 The second project I did is an underwater scene using Otterly Awesome stamps and Otter Ware – a coral reef filled with playful otters! I got out my watercolors for this, of course….Watch the video below or click HERE to see it in HD on YouTube. It’s a good thing you are here because I’m giving away an Essentials by Ellen stamp set! The winner may chose any in stock Essentials by Ellen brand stamp set (Maximum value $25 USD) at Ellen Hutson.com To enter, please leave a comment on today’s post by Tuesday, February 28! There is also an AMAZING Grand Giveaway on the CLASSroom! To enter, be sure to leave a comment there, too, by Tuesday, February 28! ALL winners will be announced at the CLASSroom on Friday, March 3! Please check there on that date to see if you are a winner and for further details on claiming your prize! Go visit the lovely Laurel Beard ! wow!! Tnese are so darn cute! And all of the copic colouring – you make it look so easy; I haven’t tried it yet, but will have to one of these days! !